Poor Zemlinsky! His life seemed to be full of frustrations; ever the perfectionist, he toiled on and off for some eleven years on a ballet, based on a Hofmannsthal scenario, Der Triumph der Zeit ("The Triumph of Time"). Zemlinsky began work on his ballet early in 1901 but by the end of that year he had rejected Hofmannsthal's projected third act and learned that Mahler, then the director of the Court Opera refused to stage the ballet there. To add insult to injury, Zemlinsky's fiancé, Alma Schindler, decided to marry Mahler instead of himself! This personal crisis brought work on the ballet to a standstill but the Three Ballettstücke were premiered in Vienna in February 1903 giving Zemlinsky the incentive to resume work and a second act was published, under the title Ein Tanzpoem ("A Dance Poem") in 1904. He also made an attempt at a third act in 1912. This suite, Three Ballet Pieces, opens with a musical depiction of the passage of time followed by two 'dances of the hours' from Act II of the ballet (Reigen and Presto) framing Fauntanz which was in fact the only Act II piece he completely orchestrated. The dance of the 'joyful happy hours' and the final dance of the 'hours' and 'moments' are enacted in an idyllic green meadow on the slopes of Mount Parnassus while the central movement, 'dance of the fauns', is set in a laurel grove by the sea at dawn. Zemlinsky's music is utterly charming. The first movement, 'without indication' opens quietly and slowly on lower strings to give an impression of time moving slowly but remorselessly forward. Soon the atmosphere and the music lightens as the dance on Mount Parnasus gracefully proceeds. The delicate but luscious scoring leaves no doubt about the influence Zemlinsky had on his pupil Erich Wolfgang Korngold. The joy of this dance is clouded just sufficiently to remind us that time eclipses all revelry. The odd bass rumblings might suggest some intruding bacchanalian revelries. The central movement is very beautiful; these fauns are clearly very playful and probably sly and mischievous. Zemlinsky creates quicksilver music for them with some very interesting rapid string effects that add a sheen over the texture. Alternating with the fauns high spirits, are passages that suggest a sultry early morning. This is impressionistic music but curiously it frequently sounds more Italian than French. The last movement is a headlong dance of abandoned joy with very much a sense of childish innocence. This is a very appealing sixteen-minute work which Rickenbacher interprets with refinement, delicacy and wit. Three Psalms 83; 23, Op. 14; and 13 Op. 24. Zemlinsky's settings of these psalms are most impressive. They occupy the major part of this album (some 37 minutes). They all seem to have been composed when various crises in the composer's life threatened to overwhelm him. All the texts dwell on the sense of abandonment felt by the believer in the face of his foes but all finally take comfort in the praise of God. Zemlinsky's father died in June 1900 and Zemlinsky immediately composed a setting of the 83rd Psalm for mixed choir and orchestra. Oddly enough the composer never seemed to push its publication; indeed it was not performed until 1987, many years after his death (in 1942.) Ten years later, however, in 1910, Zemlinsky returned to the idea of setting psalms and composed his 23rd Psalm for mixed choir and orchestra premiered by Franz Schreker later that year. His setting of this psalm which, like the 83rd, is a cry to God for protection from danger, had some irony for his career had suffered set-backs following the Mahler's resignation from the Vienna Court Opera and the planned premiere of Zemlinsky's opera Der Traumgörge, there, was cancelled. The setting of the 13th Psalm dates from 1935 two years after he had been driven from Berlin by the National Socialists. The psalmist's questions "How long shall I seek counsel...and be so vexed in my heart?" certainly had personal relevance for him then. In each of the settings a similar pattern is noticeable: three equal parts differentiated from each other by tempo, time signature and key but linked by thematic motifs. 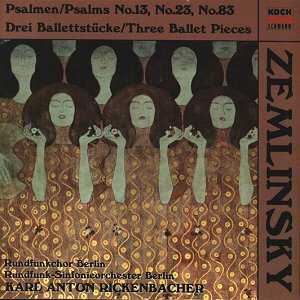 Zemlinsky's Psalm 83 is magnificent - what a pity the world had to wait so long to hear it. It is finely constructed and wonderfully orchestrated.. Beginning gravely in lower strings and quickly developing into a tremolando of dread, the orchestra breathes despair until a fanfare introduces hope. Hope and despair alternate until the glorious climactic fugue with the multi-part voices arching triumphantly over the orchestral peroration. Here the music begins in the classical choral tradition of Bach but reaches a weighty grandiloquence one associates with the turn-of-the-century English choral tradition. The work is dramatic, deeply felt, accessible and melodious. Rickenbacher's forces deliver a moving and thrilling performance. The setting of Psalm 23 impresses greatly too in the serenity of its opening pages. Beginning quietly with a hint of trepidation, we are "led by still waters" and a pastoral paradise with harp and celesta prominent and soothing women's chorus. This is imaginative writing of a high order. As the music moves into more of a mood of despair, Zemlinsky's inspiration falters somewhat, however; until the music has processed out of the shadows and back to the state of ecstasy with which the movement began. Psalm 13 is the darkest of the three. The beast (typified by sneering bassoons) is closer, despair deeper and cries for the Saviour, the most desperate. The middle section is a lengthy blizzard of an orchestral interlude which explores a very bleak landscape. The third section, a closing apotheosis is the most powerful climax of the three Psalms. It struggles upwards towards the light passing through some sensuous, almost voluptuous passages (a warning against the sins of the flesh?) Until it reaches its jubilant conclusion but even here one senses that Zemlinsky is suggesting vigilance for the beast is ever present in the shadows. Rickenbacher delivers an unfaltering, blistering performance. The booklet notes are interesting and informative but need careful reading for the English translation is sometimes rather ambiguous. This is an adventurous programme which I thoroughly enjoyed and will feature prominently in my list of the best recordings I have heard this year.